This essay was written in April and May of 2014 as a major work for a communications subject at university. Thus, as much is out-of-date, I advise reading this with that in mind. A strict word limit had to be met for this essay, as a consequence I was not able to include every argument I had initially hoped to. Lastly, please note that I wrote this during my first semester at university, hopefully my writing has improved since then. Else, enjoy! The purpose of this report is to outline problems with the current patent system in the information technology industry. Originally designed to give owners a time-limited monopoly on their inventions, patents have now far exceeded their purpose; becoming analogous to weapons of commerce. Patent litigation cases performed by ‘Patent Trolls’ have accounted for US$500 billion in lost value between 1990 and 2010 (Hayden 2011). Along with this, in one month alone, large technology companies have spent over US$20 million on patent acquisitions (Black 2013). These financial costs have become so normalised in the industry today they are being factored into the expenses of products; passing the cost onto consumers. The current patent system (including the design of patents) is not adequate for the ever-accelerating software and technology industries. Patent trolls and large companies alike have exploited features of patents originally designed to assist applicants, like flexible boundaries. Highlighting how a change in the patent system is needed now. There have been many attempts to fix or workaround the current system; none have proven ultimately successful. The effects of patent warfare, limiting innovation and product quality, are swamping the technology industry. Thus proving the industry has entered the patent generation, with no apparent escape. Patent litigation has seen a dramatic increase in scale and intensity in recent years. This litigation has surrounded technology and software patents. The world famous Apple versus Samsung (Apple Inc. v. Samsung Electronics Co. Ltd. et al 2011) highlights the extent to which multinational companies use patents in a form of warfare. With companies acquiring patents faster than they are designing products, the technology industry looks set to begin an era of financially and innovatively crippling patent litigation. A patent arms race, not dissimilar to the Cold War arms race, will only end in mutually assured destruction (Black 2013). In less than one month Google, Apple, Microsoft and RIM spent over US$20 million on patent acquisitions (Black 2013). These costs will be passed on to the consumer as they begin being factored into normal operation costs of the businesses. Section 1 will discuss nonproducing entities (NPE) – or ‘Patent Trolls’ – businesses designed for the sole purpose of filing lawsuits using patents that are not employed for production reasons. 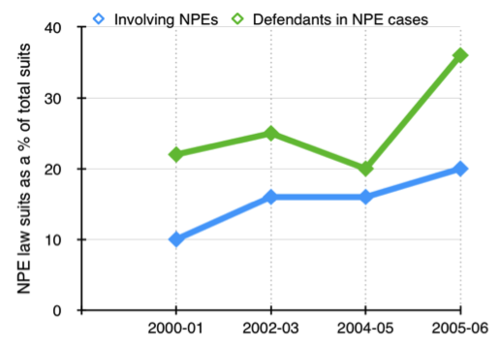 NPEs rose in number during the last decade, and NPE patent litigation cases have become even more frequent (Figure 1). NPE litigation cases, in 2011, caused over US$29 billion in direct costs (Tekic 2013). Section 2 outlines the current patent system, the issues involved, and the effects this has on technology patents. The current patent system was designed for single product firms – for example pharmaceutical firms – to allow them a time-limited monopoly on their inventions. However, with the current speed of the technology industry, patents now pose a threat as tools that, once out-dated, will be used as weapons in commerce (Black 2013). Section 3 outlines the predictions for the future of technology patents. Australia recently implemented a low level patent system, allowing for stricter procedures in patent applications. This system, however, still contains problems, causing the United Kingdom to rule to exclude a low level patent system. Another recommendation is the use of contract law to prevent companies from employing patents for anything other than defensive litigation. This essay will highlight the vast negative effects of patents on the technology industry. Showing how they can cause more harm than good and limit the prospects for future innovation. Companies that file for or buy patents with the sole intention of enforcing them against infringers are known as ‘Patent Trolls’ (Fischer & Henkel 2012). NPEs are companies that hold patents without using them. Patent trolls and NPEs are a primary concern of the current patent system, with Hayden (2011) showing that they affect all industries. The business model of NPEs surrounds the profiting off other company’s products. In order to do this, NPEs obtain patents that are more likely to be infringed (Fischer & Henkel 2012). These patents are so broad that they could, and are, applied to many different aspects of the technology industry. The threat of litigation and the consequential out-of-court settlements are the main business operation for patent trolls (Tekic 2013). As a consequence, today it is almost impossible to start a technology firm without breaching multiple patents of NPEs, which leads to financially crippling litigation (Levy & Tang 2012). Patent litigation results in increased costs for consumers and decreased innovation. In 2011, there were 5842 patent court cases involving 2150 companies (Tekic 2013). These cases incurred US$29 billion in direct costs (Figure 2). Through calculating the stock market following patent litigation, Hayden (2011) concluded that between 1990 and 2010 defendants of cases lost US$500 billion in value. Defendants have a 92 percent success rate in court, showing many of the NPEs claims are baseless (Levy & Tang 2012). Figure 1 shows the rise in the number of NPEs and more importantly the number of defendants in NPE patent litigation cases. Thus proving that the issue of NPE patent litigation is growing year-on-year. Financial costs of NPE litigation results in lower innovation. Figure 2 shows an exponential increase in the cost of litigation defenses, to astoundingly high amounts. The fear of having to pay a fraction of this is undoubtedly results in lost innovation. Levy and Tang (2012) conclude that NPE patent litigation is causing pioneers to cease work rather than incur financially crippling costs. The loss of innovation is inestimable, and thus difficult to include in arguments. Despite this immeasurability, loss of innovation is a serious cost of patent litigation. Those most publicly affected by intense patent litigation have begun forming NPEs of their own. Rockstar Consortium, owned by Apple, Microsoft, Blackberry, Ericsson, and Sony, is a giant nonproducing entity, owning US$4.5 billion in Nortel telecommunication patents (‘United States : Cisco moves to fend off Rockstar patent assault on its customers’ 2014). Rockstar has taken patent litigation to a new level of intensity, by sharing patent titles among a collection of subsidiaries in “a very aggressive tactic that flies in the history of these patents” ('United States : Cisco moves to fend off Rockstar patent assault on its customers’ 2014). Today, NPE patent litigation has risen from inventors protecting their ideas to multinational’s attacking their competitors. The structures of patents are not designed for technological innovation. A patent’s main component is its claims; these claims outline the boundaries, or purpose extent, for the patent (Chiang 2010). The function of a patent’s claims is to “inform the public during the life of the patent of the limits of the monopoly asserted, so that it may be known which features may be safely used or manufactured without a license and which may not.” (Permutit Co. v. Graver Corporation 1931, p. 60). In traditional use of patents this was perfectly suitable, allowing companies – for example a pharmaceutical company – to produce a good exclusively for a period long enough for them to reap the reward of their investment. A flaw in the system, however, is the ability for patent proprietors to change the claims of their patents even after issuing. An analogy to this is your neighbour moving the fence between their property and yours, and then proceeding to sue you for trespassing (Chiang 2010). The reasoning behind this ‘feature’ of patents is to allow inventors to adjust patents as their inventions change, consequently removing the need to file for new patents at each minor amendment. As without flexible claims, patentees will incur significant costs protecting revisions to their inventions, or will have to go without protection, the exact case patents were originally designed to prevent. To be awarded a patent, the applicant must show: “that the subject matter is patentable, novelty, utility, [nonobvious], and how to enable someone to recreate the invention” (Black 2013, II A). Novelty is achieved by proof of no prior art, thus showing it is not already known or already patented. A United States Patent and Trademark Office (USPTO) patent examiner conducts research for prior art, though individuals may also provide prior art of their own in order to counteract a patent application. The USPTO is bombarded with frivolous patent applications, however, due to the understaffing and lack of resources present, patent examiners are unable to research all patents to the extent required (Levy & Tang 2012). In 2008, Roddy McKee Bullock caused an outcry among the technology community for attempting to patent the longstanding method of online advertising: Method for making money on the internet (Bullock 2012). The patent, which has not been granted yet, outlines claims that are neither novel nor nonobvious. While not all frivolous patent applications become real patents, enough do to cause harm to the industry. Software is unlike any other industry and thus requires unique patent laws. Viewpoints that software is so profoundly different to other patent-warranting industries have led many to argue that the USPTO needs to discontinue issuing software patents (Black 2013). Nearly two thirds of all patent litigation involving NPEs are over software patents, from 1987 to 1995 the quantity of software patents rose by 350% (Raghu et al. 2008, p. 72). In September 2011, Quentin Palfrey (Senior Advisor to CTO for Jobs and Competitiveness at the White House Office of Science & Technology Policy) responded to a White House petition, signed by 14,862 individuals, to cease the USPTO from issuing software patents (Palfrey 2011). Palfrey stated that patents are necessary, but congress is looking into alternatives. In the pharmaceutical industry, firms rely upon a single patent to stay in business. However, “Software almost always builds on previous work, so patents rarely reflect the kind of original work that patent law is supposed to protect” (Lemley & Shapiro 2007). Due to the speed in which the software industry moves, technologies outlined in patents become outdated long before the twenty-year monopoly expires. Thus, Black (2013) argues, “once the technology becomes outdated, the patent is only useful as a weapon against competitors”. Features of patents that are suitable and warranted for traditional patentable inventions cause issues when applied to software. Hence, the current patent system is not able to accommodate the technology, and specifically software, industries. What can be done to fix this patent problem? It is clear that patents were conceived for an industrial era far removed from the current information era. Changes need to be implemented if the information technology industry is to continue producing without crippling financial costs. Contractual agreements in patent transfers can be used to limit aggressive litigation. The ‘Pull-to-refresh’ gesture known internationally as the mobile gesture for refreshing content by swiping down on the screen is outlined in a patent held by Twitter. Loren Brichter, the inventor of the pull-to-refresh gesture, had his company, and thus patents, acquired by Twitter for the intention of use in their official iPhone application (Lessin 2013). 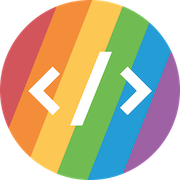 Brichter negotiated into his contract of acquisition that Twitter must allow other developers to implement their own pull-to-refresh. Twitter’s contract, the ‘Innovator’s Patent Agreement’, means Twitter can only litigate the patent with the intent of defence not offence (Lessin 2013). Contractual agreements, limiting the lawsuit possibilities of patents, between the inventor and owner are becoming more common today. While a possible way of overcoming aggressive patent litigation, as a compromise to the patent system, this method has many negatives. The use of contracts to limit the reach of patents relies upon both the inventor and the proprietor of the patent agreeing upon terms that do not directly benefit them. This ideal is most likely unreachable, as most firms would prefer to profit, than contribute to a workaround that not all firms endorse. Contractual limitations on patents are inadequate in their effects on the patent problem, and will not be an appropriate solution. Many designs for ‘fixing’ the patent system have been conceived with varying degrees of success. Since as far back has 1870 scholars and business people have all attempted to find the perfect solution to the patent problem ('Attempt to Abolish the Patent Office’ 1870). Chiang (2010) argues that a hold on the claims of a patent should be a minimum viable solution for the patent problem. As the claims outline the boundaries of a patent, and can be changed at any time, disallowing adjustments to the claims post application will fix the boundaries. Thus, limiting the increasing trend of slowly removing clarity from claims, using the vagueness to the persecutor’s advantage. Another suggested change to the United States patent system would be the implementation of a low level patent system similar to Australia’s ‘The Innovation Patent System’. Recently, changes to the Australian system have meant that patents are compared against a broader range of prior art and inventors must provide greater proof their patents work (McKinley 2013). The Australian Government Advisory Council of Intellectual Property preliminary reports indicate a positive response to these changes by small and medium businesses (McKinley 2013). Despite this, the United Kingdom decided to not implement a low level system, stating they would disallow low level patents from their current system on the grounds they stifle innovation (Hughes & Mina 2010). The United States congress passed a bill in 2011 designed to slow the NPE market, though the bill has been labeled as timid (Levy & Tang 2012). Black (2013) argues that a total overhaul of the United States and international patents systems is required, though it is a dream that is unreachable due to large companies’ deep entrenchment in the system as it stands. Thus, a fix is needed, but a suitable and achievable one is yet to be found. Though still useful in many industries, it is clear that patents are undermining the technology industry. The USPTO’s lack of resources and the fundamentals of patent design cause many patents to be frivolous and unsuitable in the fast moving software industry. Broad claims of many patents have allowed for an industry of NPEs profiting off litigation. Total abolishment of the patent system is not a suitable solution, as many industries rely heavily on its protection. Attempts at fixing the technology patent problem have had varying degrees of success; however, an appropriate answer is yet to be found. Thus, the technology industry has entered a generation of litigation over innovation: the patent generation. 'Attempt to Abolish the Patent Office’ 1870, Scientific American vol. 23, no. 21, p. 328. Black, M. 2013, 'Innovation and consumers as casualties of war in global technology patent battles’, Transnational Law & Contemporary Problems, vol. 22, no. 1, 2013 Spring, p. 181. Bullock, R.M.K. 2012, 'Method for making money on the internet’, Google Patents, http://www.google.com/patents/US8296192%3E. Chiang, T.-J. 2010, 'Fixing patent boundaries’, Michigan Law Review, vol. 108, no. 4, p. 523-575. Fischer, T. & Henkel, J. 2012, 'Patent trolls on markets for technology – An empirical analysis of NPEs’ patent acquisitions’, Research Policy, vol. 41, no. 9, pp. 1519-33. Hayden, E.C. 2011, “Patent trolls’ target biotechnology firms: opportunistic patent litigation threatens the life sciences’, Nature, vol. 477, p. 521. Hughes, A. & Mina, A. 2010, The Impact of the Patent System on SMEs, Cambridge, United Kingdom. Lemley, M.A. & Shapiro, C. 2007, 'Patent Holdup and Royalty Stacking’, Texas Law Review, vol. 85, no. 7, pp. 1991-2049. Lessin, J. 2013, 'High Priest of App Design, at Home in Philly’, The Wall Street Journal, Mar 18, 2013. Levy, S. & Tang, V. 2012, 'The Patent Problem’, Wired, vol. 20, no. 12, Dec 2012, pp. 202-n/a. McKinley, D. 2013, 'Australian Innovation Patent System under review: will it remain ‘the strongest patent system in the world’?’, Mondaq Business Briefing. Palfrey, Q. 2011, Direct the Patent Office to Cease Issuing Software Patents | We the People: Your Voice in Our Government, 2014, https://petitions.whitehouse.gov/petition/direct-patent-office-cease-issuing-software-patents/vvNslSTq. Raghu, T.S., Woo, W., Mohan, S.B. & Rao, H.R. 2008, 'Market reaction to patent infringement litigations in the information technology industry’, Information Systems Frontiers, vol. 10, no. 1, pp. 61-75. Tekic, Z.D. 2013, 'Threat of Litigation and Patent Value’, Research Technology Management, vol. 56, no. 2, pp. 18-25. 'United States : Cisco moves to fend off Rockstar patent assault on its customers’ 2014, Mena Report. Apple Inc. v. Samsung Electronics Co. Ltd. et al (2011) U.S.
Permutit Co. v. Graver Corporation (1931) 248 U.S. 52.